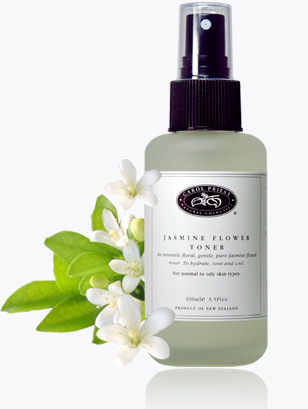 In celebration of jasmine this month, I'd like to mention Carol Priest's Jasmine Flower Toner. I can no longer find it in town, but when I did I truly enjoyed a more light handed experience of jasmine on my face. Jasmine offers some wonderful properties for the skin. It is particularly recommended for sensitive skin, so enjoying it in this light and safe quantity (this is not a true hydrofoil, but rather jasmine absolute emulsified into distilled water, with the aid of alcohol and carprylyl/capryl glucoside). This ingredient is vegetable-derived and has surfactant, solubalizing and cleansing properties. Ingredients: Distilled Water (Aqua), Alcohol, Caprylyl/Capryl Glucoside, Jasminum Officinale (Jasmine) Oil. P.s. I have no idea why images of orange blossoms were used to illustrate this product on the company's website; but not it's a common mistake. I've even seen citrus blossoms (probably pomelo, actually) labeled as jasmine flowers in a rather famous tea-related coffee table/resource book. Jasmine floral water is not truly a hydrosol because jasmine is not steam-distilled. Nevertheless, I really enjoy this product and will look into making my own some day! For now, I'm smitten with the avocado oil, chamomile and jasmine face serum I made - supposed to be good for sensitive skin! Sounds wonderful. I love blending my own oils but while I make lip balms I tend not to go into other proper cosmetic products. In your facial serum do you use refined avocado? Because I know it is great for skin but I dislike the chlorophyll-y smell of pure avocado oil! Great that you are experimenting with your own lip balms! They're fun to make and relatively easy. I use refined avocado oil, as it is more stable (lasts longer without getting rancid), and also neutral in fragrance.